EVERY day, S C Datta, a senior scientist at the Indian Agricultural Research Institute (IARI) in New Delhi, gets numerous calls from inquisitive farmers and fertiliser companies, asking him if the new soil testing instrument is ready. After getting a glimpse of what is being dubbed as a breakthrough instrument at the Krishi Vigyan Mela at IARI in February, people in the agriculture business cannot wait for this new device to arrive in the market. The reasons for their excitement are many. One, farmers are not aware of what all nutrients the soil is deficient in. Two, they are not sure how much fertiliser is to be applied. This ignorance is exploited by fertiliser manufacturing companies that easily force their products on farmers. Three, the facility of soil testing is available only at regional soil testing labs and farmers have to travel long distances. Four, the instruments currently in use are expensive. “The new device is portable and suitable for individual use. The meter gives you exact numbers,” says Datta. The agriculture scientist started work on the soil meter—Soil Test and Fertiliser Recommendation (STFR)—eight years ago. “It was my baby,” he says. “Initially, it was not even given the status of a division project and I would work on it in my free time and shell money out of my pocket.” When Datta gave a final shape to it in 2009, IARI scientists were impressed and it became a division project. Since then the meter has evolved from being a bulky analog instrument to a purely digital meter. “It’s the first-of-its-kind in the country and probably the world,” says Datta. The soil sample is taken in a test tube. The quantity of the sample depends on the nutrient for which it needs to be tested. The soil is then mixed with an extracting reagent which separates the nutrients from the soil. The solution containing the nutrients is filtered out and mixed with the colouring reagent designated for the nutrient. The sample is then placed in the sample holder in the device. Based on the intensity of the colour of this solution, the meter determines the amount of the nutrient in the soil. The device can also indicate how much fertiliser is required in the soil for a particular crop and yield and can be programmed for a specific region. For this only a chip needs to be inserted. Om Rupela, former scientist with International Crops Research Institute for the Semi-Arid Tropics in Hyderabad, says the meters are not very helpful as they mostly measure three elements. “A crop needs about 30 elements for a balanced growth and not just nitrogen, phosphorus and potassium widely sold in markets.” He adds that farmers engaged in sustainable agriculture do not even apply chemical fertilisers and this machine is of no use to them. Datta defends saying very few farmers practice organic farming in India, but admits that the device will be useful to farmers with some basic knowledge of computers and English. Datta expects the meter will hit the markets in the next four months. The meter will cost Rs 5,000. Along with the entire kit, which includes reagents, the cost will go up to Rs 8,000. The institute is also in talks with firms to commercialise the product. 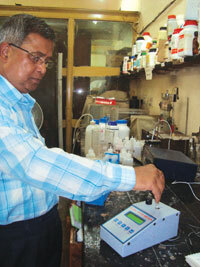 Wanted soil nutrient tester, how to get? please send me the price list of Mobile soil nutrient tester. and where can i get this apparatus. What is the Approximate cost of the PUSA STFR now? Please confirm whether mobile soil nutrients tester has been launched. If so what is the cost & from where its available. In this article the cost mentioned as ~ 8K but today Feb 2018 I saw the PUSA SFTR markets ~ 70K...what is the logic behind this.